This entry was posted in Bonds, Economy, Mortgage and tagged interest rate, Recession, Yield Curve on May 17, 2017 by Bone Fish. Fed Raised Rates Once During Obama Years, Yet Promises Constant Rate Hikes During Trump Era? This entry was posted in Economy, Housing, Mortgage and tagged Donald Trump, Federal Reserve, interest rate on December 16, 2016 by Bone Fish. 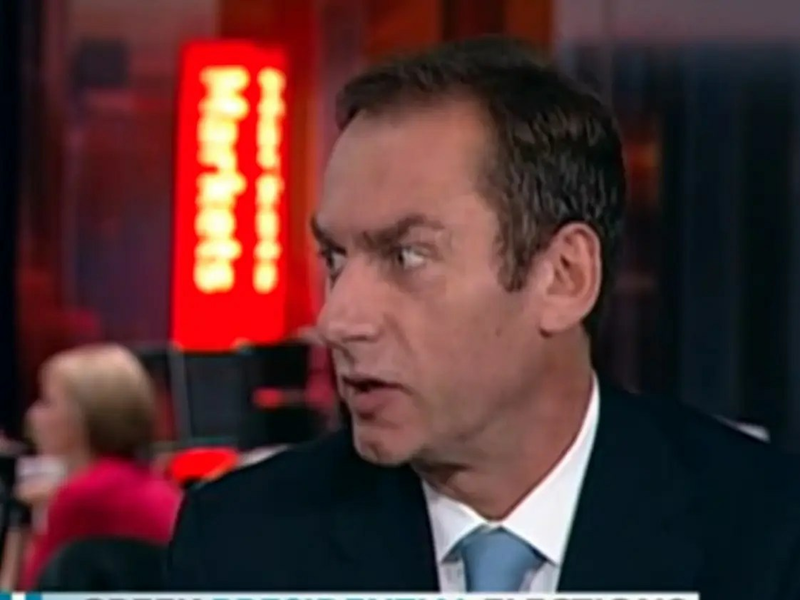 HSBC’s Steven Major is out with a bold new forecast. 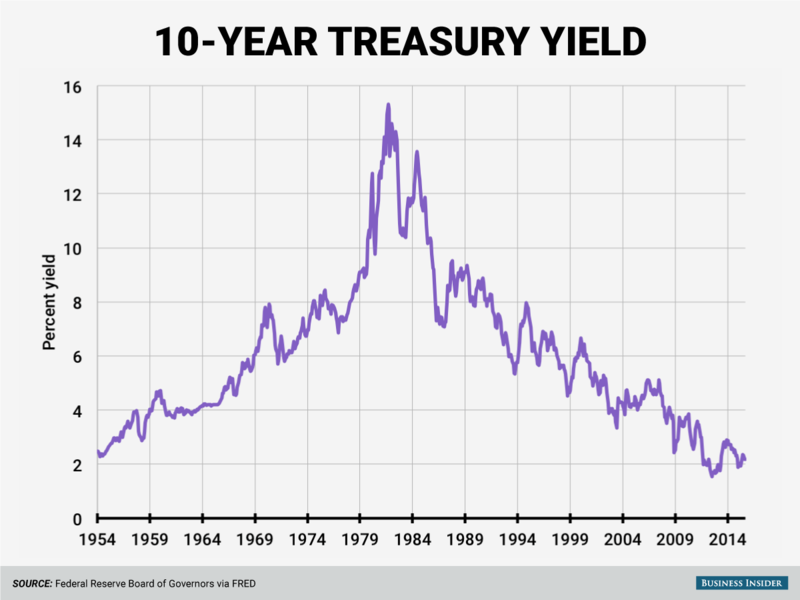 In a client note on Thursday titled “Yanking down the yields,” the interest-rates strategist projected that bond yields would be much lower than the markets expected because central banks including the Federal Reserve were reluctant to raise interest rates. Major sees the benchmark US 10-year yield, now at 2.05%, averaging 2.10% in the fourth quarter, but then tumbling to 1.5% by the third quarter of 2016. 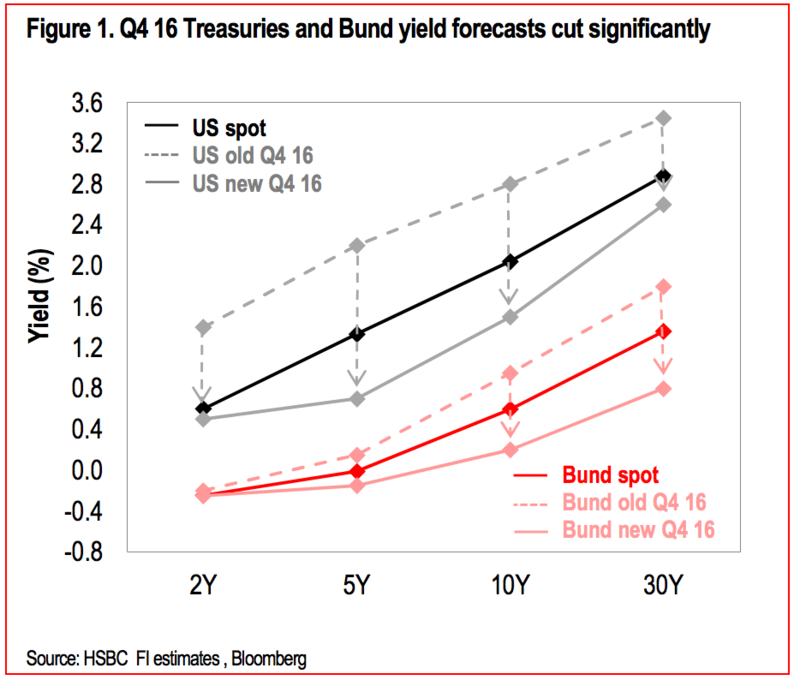 He also lowered projections for European bond yields. According to Bloomberg, the median strategist’s forecast is for the 10-year yield to rally to 2.9% by Q3 2016 and 3.0% by Q4 2016. Of 65 published forecasts, Major’s 1.5% call is the only one below 1.65%. Much of the shift lower in our yield forecasts derives from the view that the ECB [European Central Bank] will continue to buy bonds in its QE [Quantitative Easing] program. The forecast for a ‘bowing-in’ of curves reflects our opinion that a long period of unconventional policy will create an unconventional outcome. Central banks did not forecast the persistently weak growth or recent decline in inflation. So data dependency does not easily justify lifting rates from the zero-bound — it might suggest the opposite. 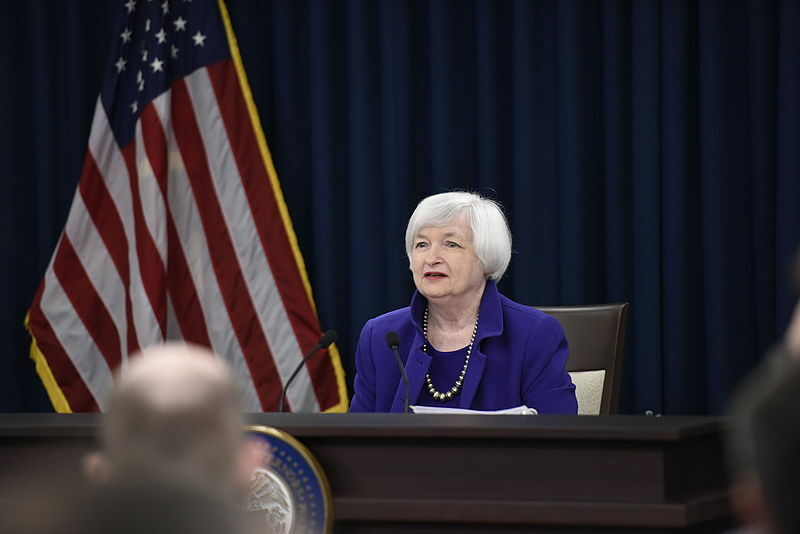 In September, the Federal Reserve passed on what would have been its first interest-rate hike in nine years, as concerns about the labor market and global weakness weighed on voting members’ minds. Also last month, European Central Bank president Mario Draghi said the ECB would expand its stimulus program if needed. For years, pros across Wall Street have argued that interest rates have nowhere to go but up. Major was one of the few forecasters to correctly predict that in 2014 bond yields would fall and end the year lower. Others had predicted that yields would rise as the Fed wound down its massive bond-buying program known as quantitative easing. Once again, Major is going against the grain to say yields will fall even further, though the Fed has maintained that it could raise short-term interest rates this year. Major is in the small minority, with others including Komal Sri-Kumar, president of Sri-Kumar Global Strategies, who wrote on Business Insider earlier this week that the 10-year yield would slide below 2% to 1.5%. Also, DoubleLine Capital’s Jeff Gundlach forecast in June that bond yields would end 2015 near where they started the year. Gundlach also noted in his presentation that yields had risen in previous periods in which the Fed raised rates. The 10-year yield was at 2.17% at the beginning of January. On Thursday, it was near 2.05%. Typically, higher interest rates make existing bonds less attractive to buyers, since they can get new notes at loftier yields. And as demand for these bonds falls, their prices also fall, and yields rise. This entry was posted in Bonds, Housing Market, Mortgage, Real Estate, Stocks, Uncategorized and tagged bonds, ECB, HSBC, interest rate, quantitive easing, Steven Major, yield on October 8, 2015 by Bone Fish. Fast forward to last May, as much noise was swirling around the Fed’s tapering strategy: 30-year fixed rates ascended a full percentage point in less than 30 days, based only on the conversations of the small screen financial talking heads, and all before the Fed announced anything! Not long afterwards, borrowers started to ask me about hybrids. 3/1, 5/1, 7/1, 10/1, what is the spread between the 30-year fixed, what are the caps, what is the index, how do they work? Hybrid ARMs as the name implies, have a fixed rate component on the front end of the mortgage term (3 years, 5, 7 or 10) and an adjustable rate component on the back end of the mortgage term, when the interest rate can change/adjust annually. For example; a 5/1 ARM in today’s market could have an interest rate that is fixed for the first 5 years at 3.00% compared to a 30-year fixed rate mortgage at 4.50%. For a $200,000 mortgage, that would save $170/month. After 5 years/60 months, the interest will adjust annually based on an index (1 year LIBOR or 1 year Treasury/CMT), plus a margin of somewhere between 2.25% and 2.75%. Of course there are caps on the interest rate adjustments. Typically the initial adjustment cap is 2% above the start rate, unless the initial term is 5 years or longer, then the initial caps can be as high as 5%. The periodic or yearly caps are typically 2% above (or below) the existing rate and the lifetime cap is 5% or 6% above the initial fixed rate, depending on the term. Since birth, hybrid ARMs have maintained space on the entrée side of the menu, for a time even expanding to include interest only variations, which have become scarce now that QM is sheriff. While fixed rates have enjoyed a prolonged period of historical lows, the demand for hybrid ARMs has fallen dramatically. Enter the current generation of mortgage consumers with a seemingly much lower tolerance for rising interest rate pain than their counterparts of 20 years ago, and demand for hybrid ARMs is seeing traction. Technology has given buyers access to more information than ever before, comparing options for individual circumstances results in savvy mortgage consumer financing choices. So just why are hybrid ARMs a good fit if 30-year fixed rates are still close to historical lows? Fact is that although most people opt for 30 year mortgages, very few actually stay in the property or the mortgage for that long. People move, families grow, personal economics rise and fall and for lots of other reasons, the lifespan of a mortgage tends to be far less than the 30 years it is amortizing. The buyer with a five year planning horizon choosing the $200,000 5/1 ARM over the 30-year fixed mentioned earlier, would save $10,200 and enjoy the security of a fixed rate for those five years. If plans change as they so often do (when life shows up), the adjustment caps can protect those savings while plans are adjusted and new mortgage financing strategies are considered. This is the nature of today’s generation of mortgage consumer; they are sophisticated, they have access to more information for more informed consideration and they want what best fits their personal financial universe. At some point in the future, mortgage interest rates will begin the inevitable climb to higher norms and Hybrid ARMs will have a louder voice in the mortgage financing conversation. As with virtually everything else, organic evolution has led to 3/3 ARMs and 5/5 ARMs and other variations that together offer consumers a menu of custom made mortgage financing options for just about every circumstance. Learning the mechanics of how these loans work and matching planning horizons with adjustment periods can be a useful tool in an overall financial planning portfolio. This entry was posted in Uncategorized and tagged fixed rate, fixed rate mortgage, fixed rates, interest rate, mortgage interest rates, mortgage term on March 17, 2014 by Bone Fish.